Following a long vacation, I missed my kitchen. My motto is “Go Big or Go Home” so I decided to go big. 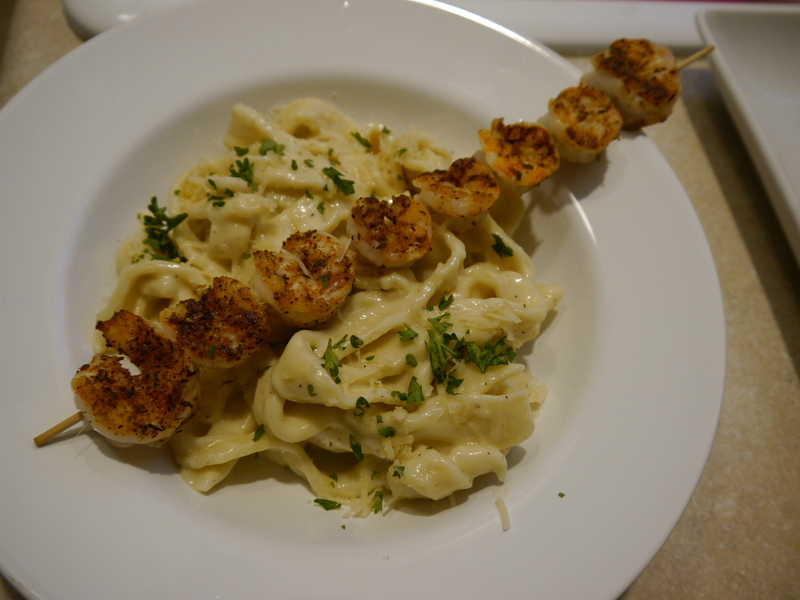 We have a new Alfredo Sauce I wanted to try and I was really in the mood for some comforting pasta. I clipped a little bit of thyme and rosemary from our herb garden at the store. 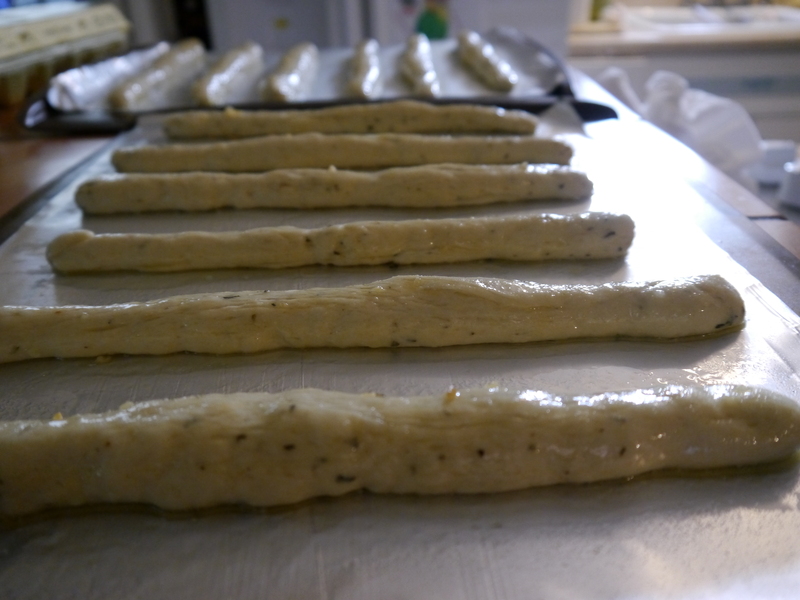 I used it to make Herb Breadsticks. I let them rise while I was preparing the rest of the meal and baked them right at the last minute. Next, I tackled the pasta. 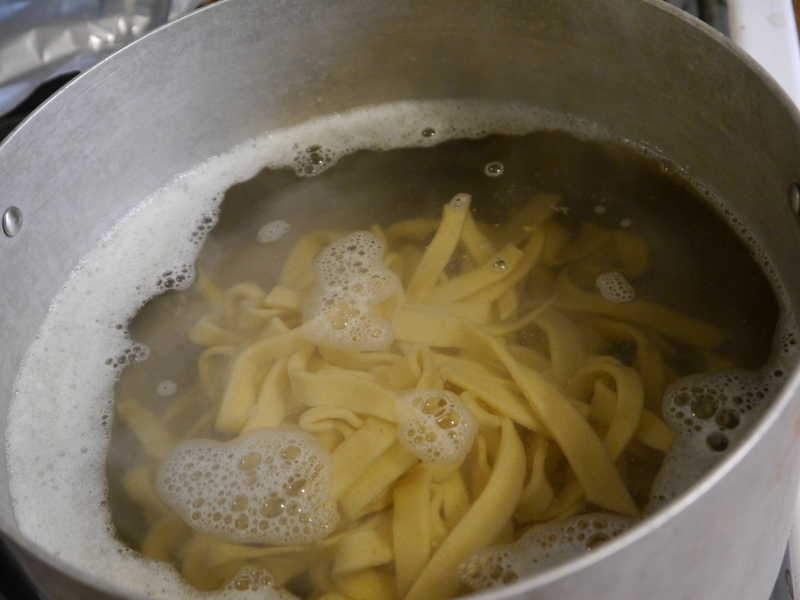 Making pasta from scratch is not something I often do. Since I was using a prepared sauce, it seemed like a fitting time to take that extra step. (Save time on one thing, spend time on another.) I made a very simple dough using 1-1/2 cups Unbleached All-Purpose Flour, 1/2 cup Semolina Flour, 2 eggs, and 2 Tablespoons of water. 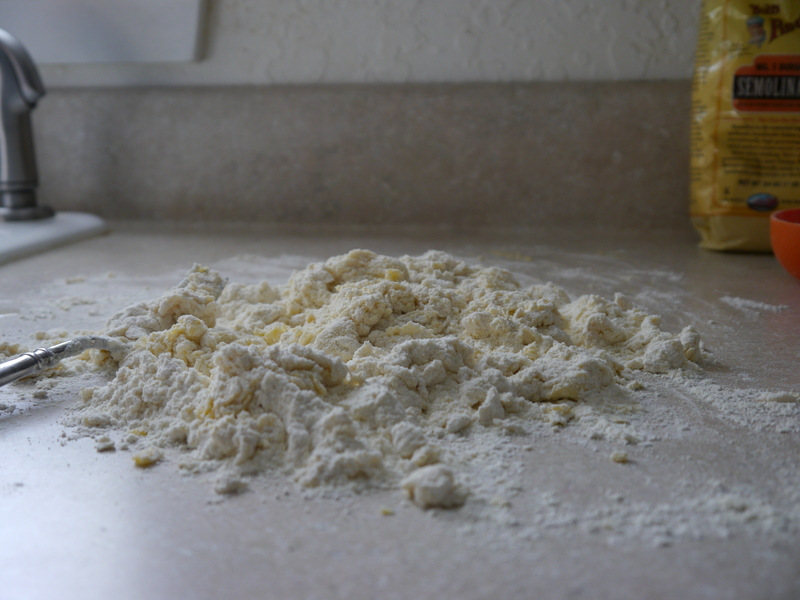 I turned it all out onto the counter and kneaded it by hand for about ten minutes. 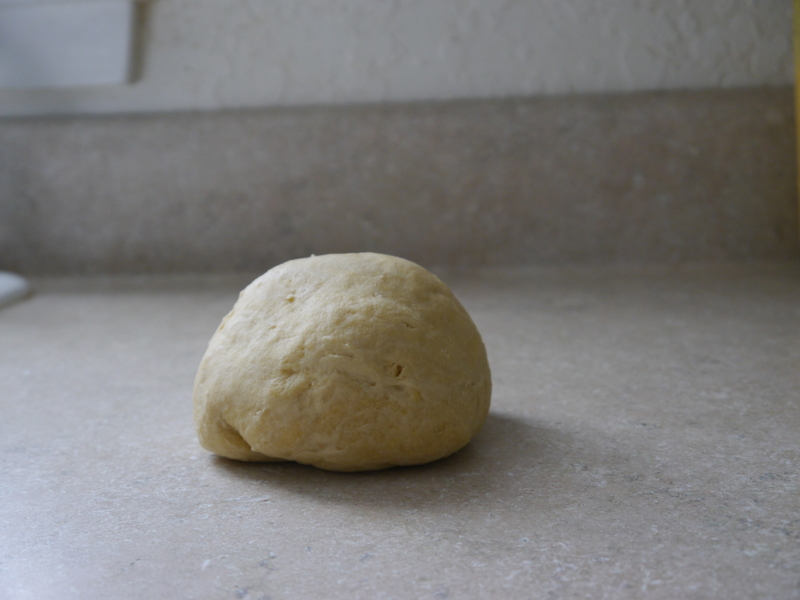 It doesn’t get elastic like yeast dough, but it gets smooth. You can tell when it’s ready. I covered it in plastic wrap and moved it to the back of the counter to rest for about a half hour while I tackled the shrimp. 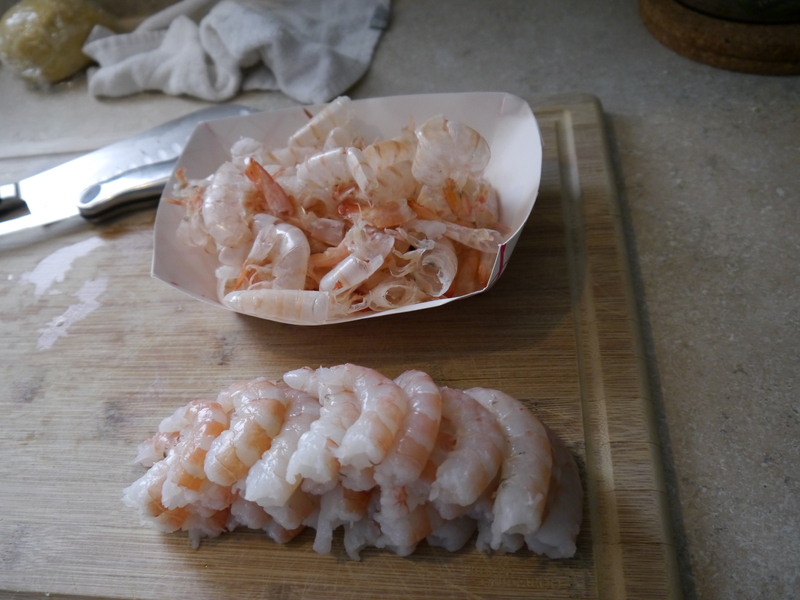 Next, I used a sharp paring knife to cut down the back of each shrimp and rinsed the vein out under cold running water. I returned the shrimp to the fridge while I went back to the pasta. 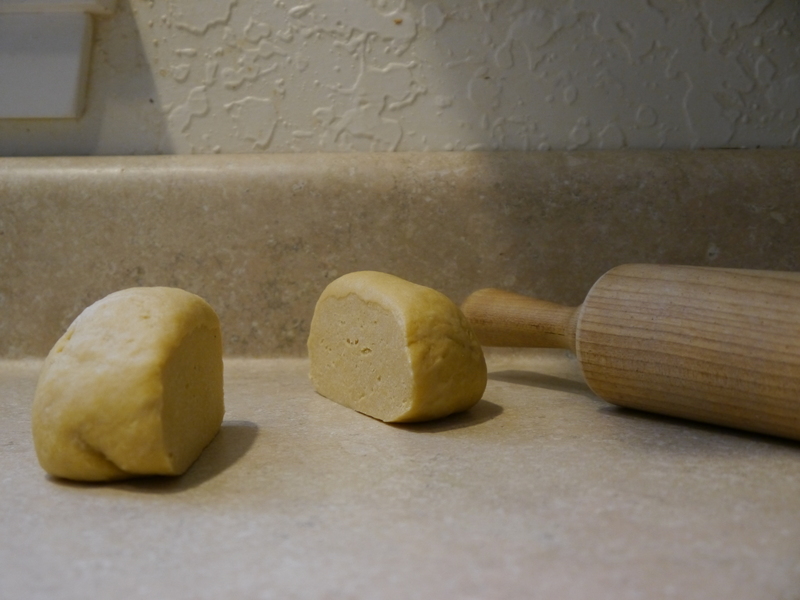 I divided the pasta dough into two pieces and started rolling it out on a lightly floured surface (use cornmeal or the Semonlina flour for this because it is less messy). I don’t have space for a lot of little kitchen appliances and I really like doing things by hand. That being said, a pasta machine is not something I have in my kitchen. 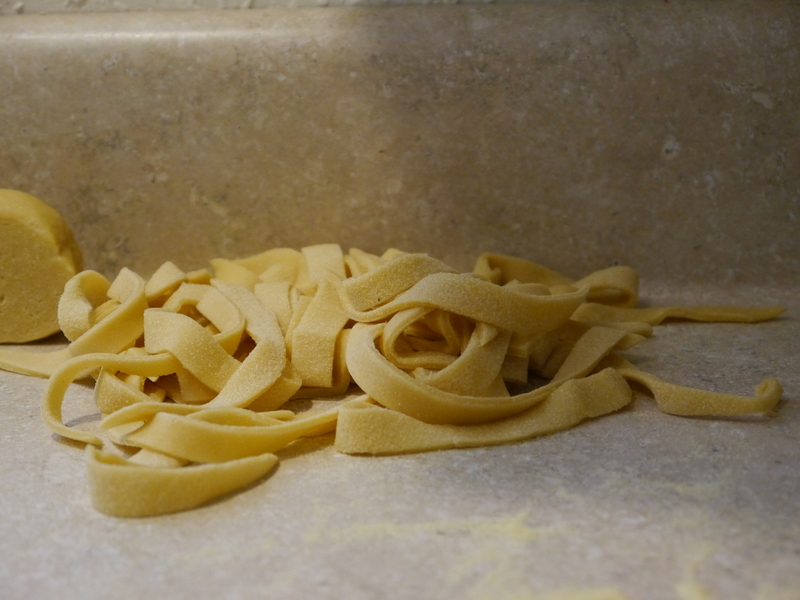 I recently read about a method of making pasta by rolling out the sheets and slicing them. Brilliant. 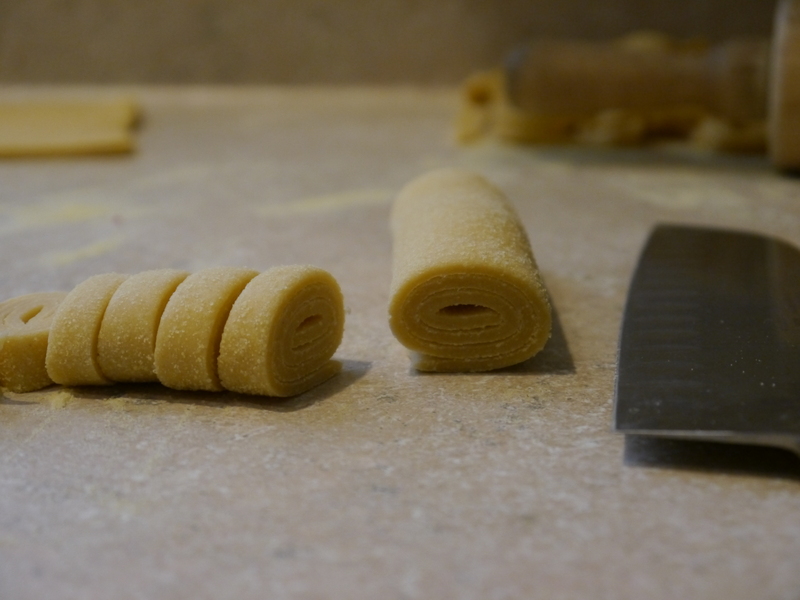 After I sliced them, I unrolled each strand and tossed it with additional Semolina flour. I set the pasta strands toward the back of the counter and left them to dry out. It takes at least ten minutes, but you can leave it until you finish whatever else you are doing. It’s forgiving. Cooking the pasta was pretty much the LAST thing I wanted to do since it takes under five minutes to cook. I prepared all my garnishes and heated the sauce. 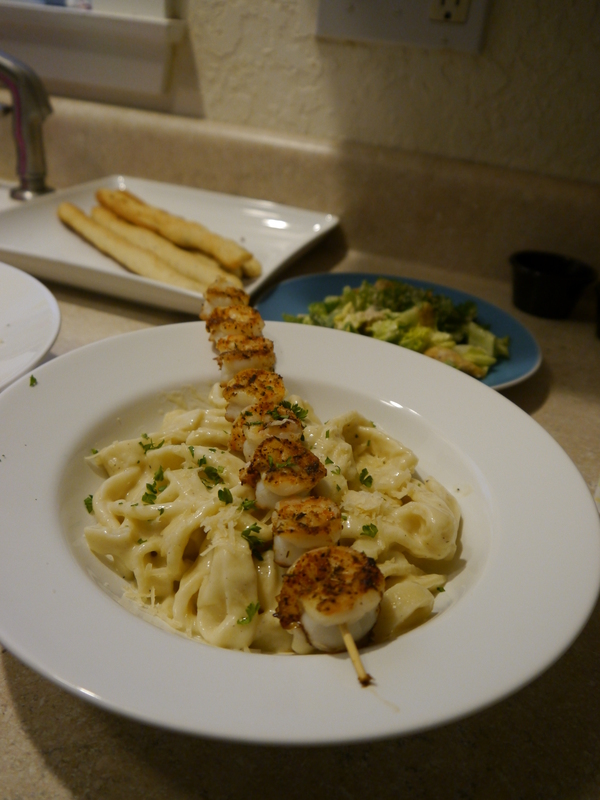 The whole inspiration for this meal was a new product we have from a company called La Pasta. They make delicious refrigerated pasta sauces. They are all natural and so tasty. I heated it in a saucepan over low heat. I will warn you that it DID take quite a bit of whisking to reincorporate it all together but once it was warm, it came together all at once. I would not recommend doing this in the harsh heat of a microwave. It might break the sauce. 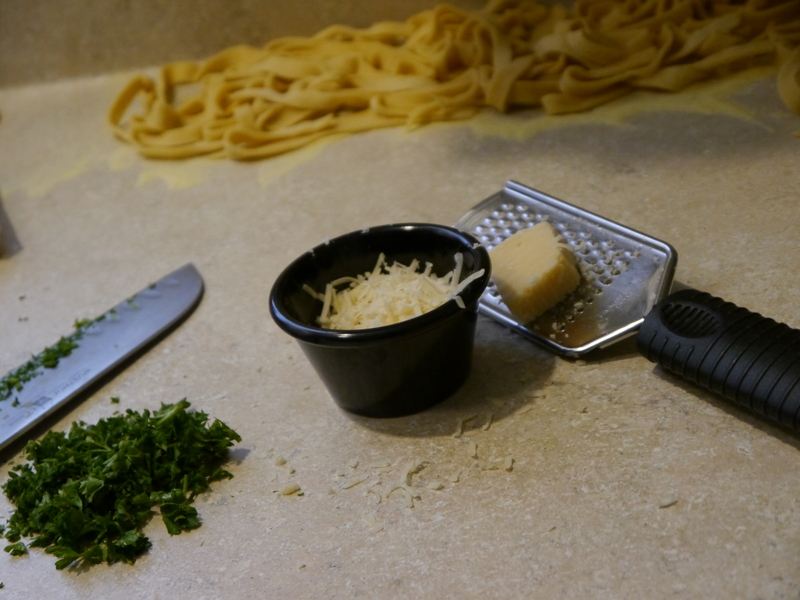 I chopped some parsley and grated some Parmesan cheese. 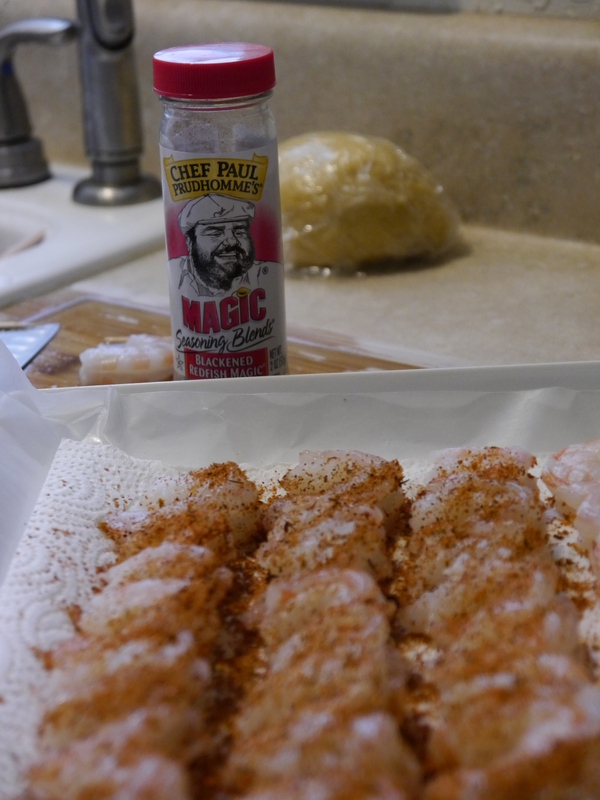 Time to cook the shrimp. Big heavy skillet on very high heat with just a touch of oil in the pan. I cooked them for about one minute on each side. I left them in the pan, removed the pan from the heat, and covered it with foil. 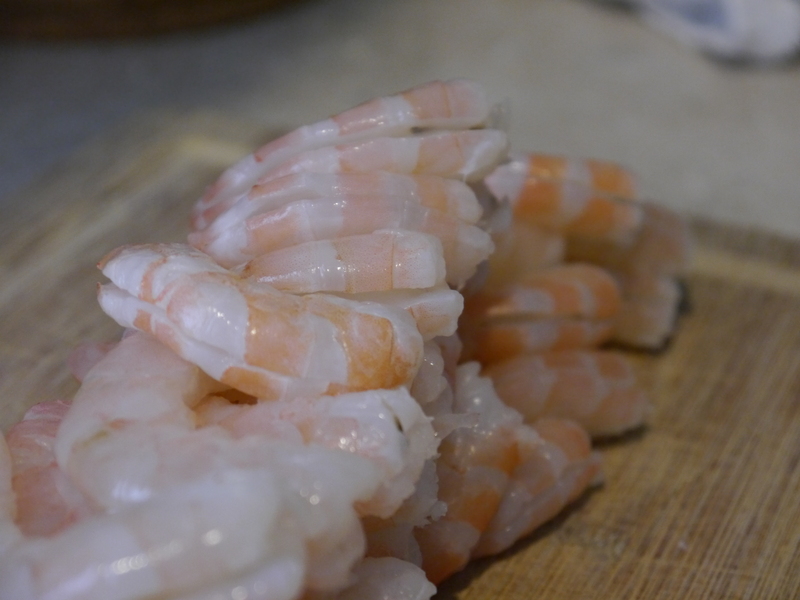 This allows the shrimp to finish cooking without applying direct heat AND it keeps them warm until everything else is ready. I brought a big pot of salted water to a rolling boil. I boiled my pasta for just under five minutes (this is a good time to assemble a salad – I made a simple Caesar salad) and immediately drained it and returned it to the pot, where I combined it with the heated Alfredo sauce. All that was left to do was assemble the meal! 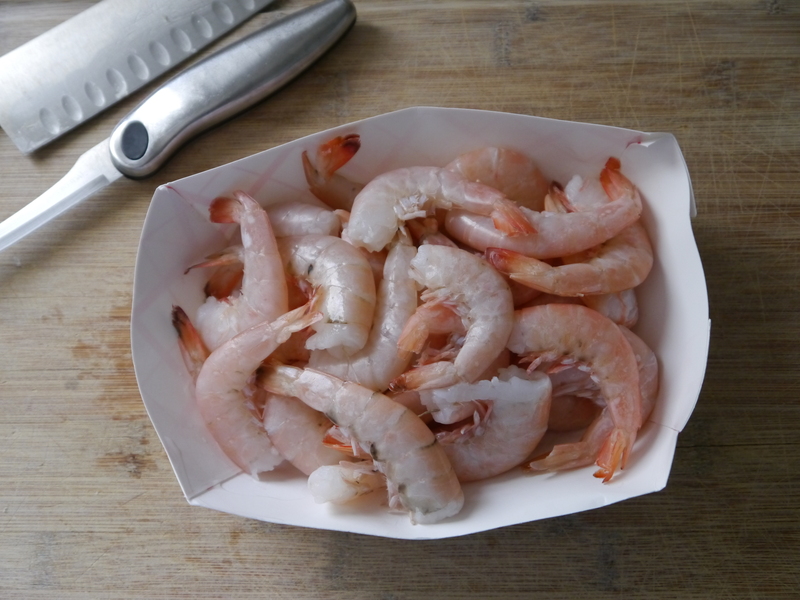 Pasta and sauce in the bottom… shrimp on top! 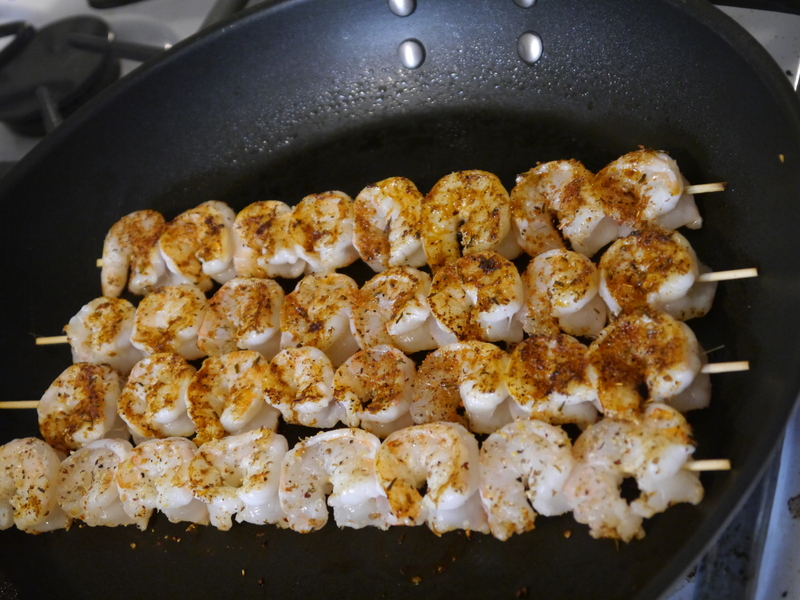 I prefer to leave them on the skewer just for the sake of presentation. 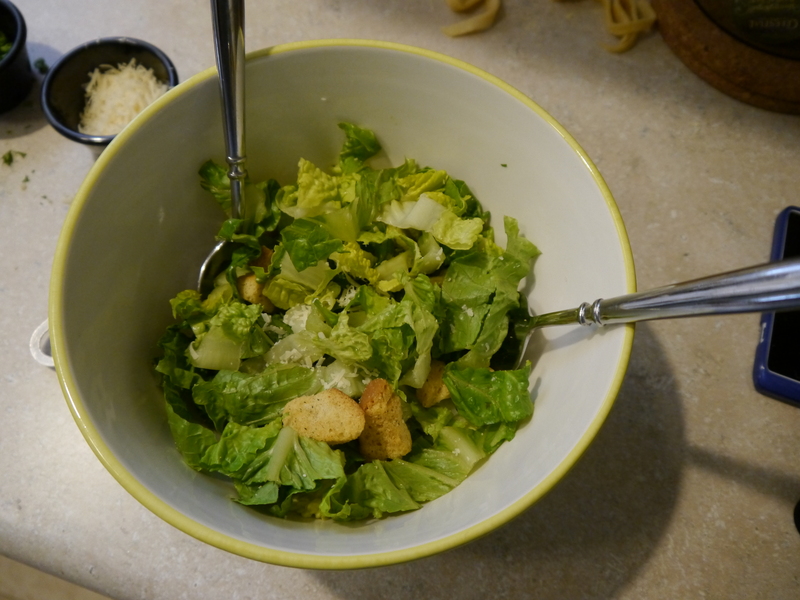 I garnished each bowl with fresh parsley and Parmesan cheese and served it with the salad and the warm breadsticks. Delicious restaurant-quality meal at home for four people for around $30! 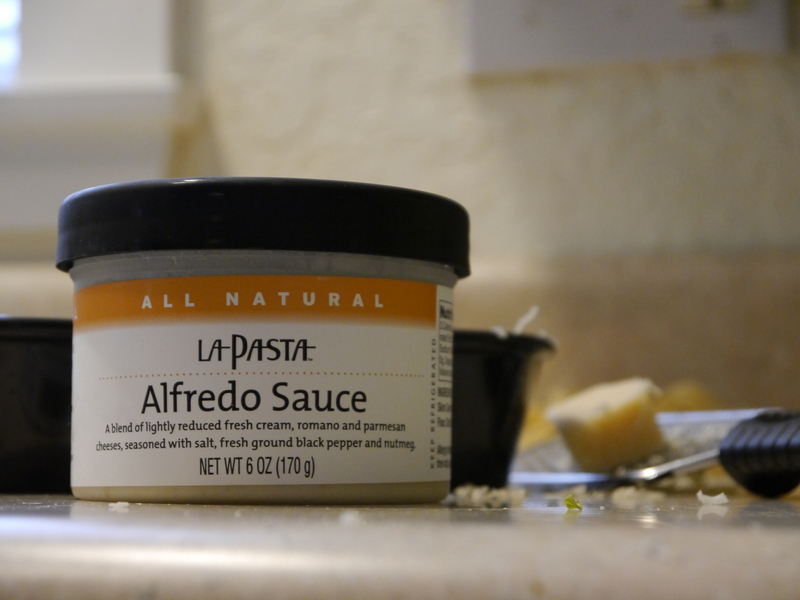 My thoughts on the sauce: this was by far the best prepared Alfredo sauce I have ever had. My husband commented that he would never have believed it was not homemade. It was not overly salty and it was so thick and creamy! And then came the food coma. ← Whole Snapper For Two! Looks aaahhhmazing! Do you have the sauces at the store? Thanks! Yes, we have them in stock now. They are in the center refrigerated case. They are delicious and so are the ravioli they make. Yum! I think I could eat that every day for a week! Love this blog already! Great how-to on this, too- so thanking you for my readers in advance. THANK YOU!!! Coming from you, this means the world to me.